PDRM is tasked with keeping us safe and protecting us from harm. Those of you who read what I write knows that my late Father served under Tun Haniff as Director CID. I have written much about PDRM, most of them uncomplimentary….but it is no reflection of Tun Haniff or of my Father’s time in the Police Force. Political influence,some say interference, had led to many questioning if the rule of law in Malaysia, is beginning to crumble. The politicisation of law enforcement has now reached a critical juncture where rogue elements within these law enforcement institutions can be found at the very top – the AG, the Inspector General of Police and Chief Justices and Judges ..a situation that has not only resulted in the loss of trust by the public for these law enforcement institutions but more disconcerting, the rot within these law enforcement authorities have begun to undermine our constitutional democracy! me was not only that Anwar Ibrahim was physically pummelled to an inch of his life….but that the deed was done by the IGP. Now whether that was done on his own volition or that he was second guessing what the then Prime Minister of Malaysia wanted him to do is immaterial….a line has been crossed and since then PDRM has strayed further into the realms of doing the bidding of its political masters rather then to keep to its appointed task of keeping the people safe and protecting them from harm. culprit of all this is the IGP himself. This is not a matter to be trifled with or ignored….for, to many of us, PDRM has indeed gone rogue and the chief culprit is the IGP himself. Today I read about the Government of India complaining that Malaysia had not provide assistance for two years for them to serve a summon on Ananda Krishnan despite a mutual legal assistance treaty existing between India and Malaysia. Why is this so? Why is PDRM not assisting a sovereign country with whom we have a mutual legal assistance treaty, to serve a summon on a Malaysian who they say have done wrong in India? Is it because he is Ananda Krisnan – a confidant of Najib Razak and a very very rich man to boot? And we all know what has been done by Police operatives in the murder of Altantuya and what PDRM has NOT done to serve justice in the matter of her murder. 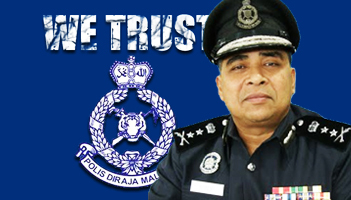 PDRM no longer acts without fear or favor…it acts for favor and in fear of its political masters. I am astounded at the audacity of this IGP who does the bidding of his political master better than what the kerbau with the ring in it’s nose would do when bid by his master…..though I think the IQ of the Kerbau might surpass that of this tweet of an IGP …..but I digress. That PDRM has now become an apendage of Najib’s Tun Razak unmentionable is obvious. That the IGP position in all this is just below Najib’s balls or arse (which he can then lick copiously!) is true and most appropriate. All things considered, the proposal to reconstruct Inspector General of Police (IGP) to Police Inspector General (PIG) seems wise given that Khalid would be one of those PIGS with their snout at the trough where dedak can be found at all hours of the day. Of course no gentleman would want to call the IGP a PIG…but then I am no gentleman – so protocol be damm. All frivolities aside, PDRM is now like the Titanic. It’s end, in its present form, is a certainity. All that is left for the IGP to do is to rearrange the deck chairs and put on his uniform as the Titanic sinks…and he sinks with the Titanic too. God forbid if he should be given a place in one of the lifeboats for his life can really be of no use to anyone but to Najib whose balls he licks. I know that Najib too will be hard pressed to find room on any of the lifeboats that Umno will need once it is cast to the abyss by the next election……and when there is no ball to lick, this PIG will be of no use to anyone else. Rosmah? She has no balls! Prostitution a source of income for PDRM? By Hussein Abdul Hamid|2018-07-14T06:16:05+08:00September 27th, 2016|Categories: Uncategorized|Tags: IGP, Najib, PDRM, rogue elements|Comments Off on Rogue Elements within PDRM.